Maybe I have a bit of spring fever because I think I've descended into madness. First off, let's look at the cause of my issues: things are blooming like crazy. Even my irises are getting into the display, including the super-shy white and pale lilac ones. So what has this delightful and intoxicating display of color caused? Yeah, that's where the insanity comes in. This is what we picked up this weekend. Yes. Do you see the insanity now? 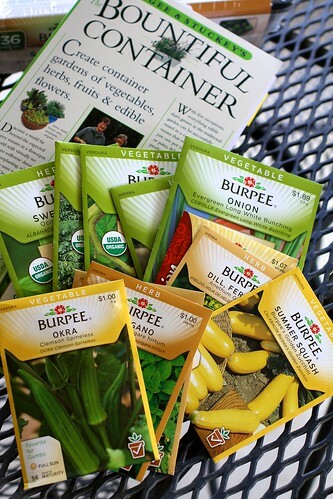 I'm going to attempt a vegetable container garden. I've got a number of seeds (12, I think?) but I only planted four this morning, specifically the ones that I thought were the biggest risk/least likely to be able to deal with our heat: bunching onions, radishes, spinach and tomatoes. Okay, the tomatoes aren't a high risk thing but I am getting started on them late since I'm growing from seed so I figured I had best get cracking. I'm most hopeful about the onions but I'm thinking the radish and the spinach will be very unhappy since things are already so hot. But I did save some seeds so I'm going to attempt to grow them in the fall, too, which I think might have happier results. Wish me luck! The bunch onions are perennial and can last a long time..And the tomatoes planted now could be ready to put outside later in the year and could be ready for fall tomatoes. 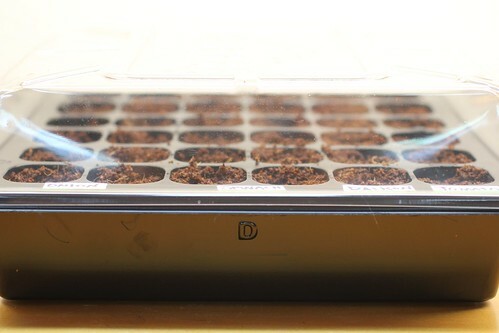 All of course depending on the time of germination. And there is a good reason there are so many seeds in a package..they don't all germinate. Yeah, I was reading about the perennial nature of the onions, so that's exciting. I'm hoping they will work out well. Also, I did plant 3+ seeds per soil mini-spot but still had a decent amount of each left (compared to the amount I started with because, for example, there were a lot more onion seeds than tomato seeds).